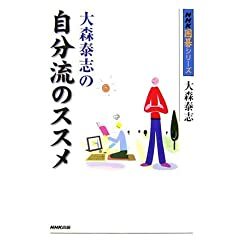 Achieving a Personal Style (大森泰志の自分流のススメ ISBN4-14-016144-2) by Oomori Yasushi. NHK(2006), 222 pages. Based on Oomori's broadcast NHK lecture series which ran from October, 2005 to March, 2006. Judging the value of stones. Of course, he doesn't mean that they should abandon all prior go wisdom. But at the very least, there is generally far more freedom in selecting a move than most amateurs commonly appreciate. In this book Oomori addresses five specific areas of play where he thinks amateur judgement is often too constrained and good moves are missed; and he teaches a freer approach. Tenuki, he says, is always fun to spring on an opponent, but amateurs have a particular blind spot towards it -- they often don't see that they could play that way, and they never see it coming when it is sprung on them. As for the value of stones, amateurs cling too often to stones which should be sacrificed. The value of stones under attack depends on their environs. As a rule of thumb, a stone in the midst of strong enemy stones is unimportant and should be sacrificed, while a stone near weak enemy stones will have proportionately more leverage against them and is likely to be worth saving. Attack does not necessarily mean capture. (Recall that Sonoda insists, in fact, that "attack *means* allowing to escape.") The purpose of attack is usually to gain territory, thickness, or some other advantage, while the opponent is too busy escaping to take counter-action in some other region where the advantage is accruing. Finally, one must have a feeling for when to reduce and when to invade. This chapter focuses mainly on positions where reduction turns out to be preferable. Even so, if done too shallowly or too greedily it will backfire. The later topics build, successively, on the earlier ones: tenuki is really a recurrent theme of the book; unimportant stones are not worthwhile targets of attack; shinogi operations are a component of reduction and invasion; etc. The chapters are organized into a total of 41 subsections, each headed with a whole board problem serving as a theme diagram. Though their sources are not all given, some are identified as extracts from games between strong amateurs; and probably all of them are. Certainly, the positions have been well chosen and are all of practical interest to amateurs. Occasionally a problem is narrowed down to selecting from a few specified choices. Both good and bad responses are explored to a satisfying tactical depth, with enough variations to be convincing. Sometimes, Oomori apparently fails to discuss what might seem to be the most worrisome response to his recommended line of play -- but then it shows up as the main subject of the next subsection; and it turns out to have been worrisome only because one is still thinking too narrowly. Some of the subsections are grouped into sets of successive positions from the same game. Usually the actual play has been suboptimal, violating Oomori's recommendations; so we see the advantage shifting from one side to the other. Also, some subsections are grouped into sets of nearly similar but subtly tweaked positions, and so we see bad responses becoming good responses. Incidentally, even though Oomori teaches routine consideration of a tenuki response, it seems that it is never healthy for the opponent to play tenuki against Oomori's suggested moves in these positions! Many of the discussions end with a helpful one-sentence summary of the main issue, marked off typographically. Sometimes it just recalls the most salient feature of the position just studied --that a particular stone was of low value, say-- while other times it enunciates a general principle, sometimes an unfamiliar one as formulated by Oomori. Also, occasionally, a recommended line of play that especially departs from common amateur practice gets showcased as "Oomori style." In some of the easier problems with specified choices I found it possible to guess the right one just by knowing, say, that this is the tenuki chapter -- so I'm supposed to tenuki! But the follow-up discussion was still thoroughly enlightening because, for instance, I wouldn't necessarily see, at first, why I should tenuki. Furthermore, most of the problems aren't that easy; and the right answer, in that particular chapter, is not always to play tenuki! While there is some nominal overlap of the topics in this book with those in other NHK volumes, the examples treated are different, sufficiently so as to eliminate any sense of duplication. Beyond that, since most of the volumes in this series are based on actual public lectures given in person by the authors, we may be sure we are getting the authentic, considered views of individual, active masters. Each of the professional player/teachers in this series has a distinctive voice expressed in the formulation of general principles, the kinds of details that are emphasized, jokes, etc. So the books are not interchangeable. This book is highly instructive and gracefully written --it is in the same class as NHK books by Ishikura and Sonoda-- and should be of interest to strong kyu players and higher. The Japanese text seems a little easier than average, somehow. 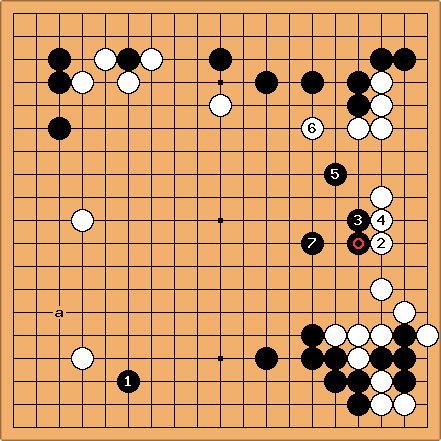 Furthermore, the discussions are organized in such a way that stronger players with only basic Japanese for reading go books could probably still learn quite a bit from just the diagrams. Here are some sample diagrams, along with condensed paraphrase of parts of the discussion, to give some specific flavor of Oomori's approach. Black to play. Playing as a splitting move at 2 might seem superficially tempting. But after another few moves B would only have created a weak group which uselessly separates two strong White groups on the right side, and so is vulnerable to attack. Several variations in the book follow that out. 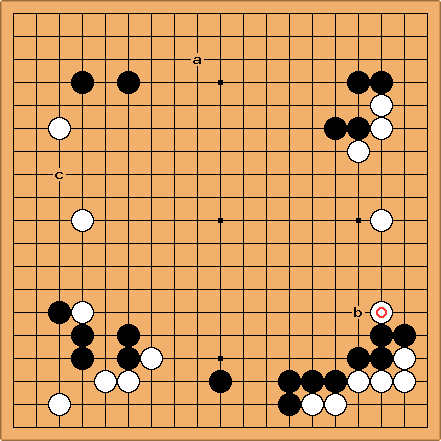 tenuki as played here, instead, makes fine use of the strength in the lower right. If W next responds with , then B, having gotten the good move in on the left, can now come back and play at the mutually desirable point , making shape with and . Right? Wrong! After , is adjacent to a strong W position; hence it is an unimportant stone. B's further moves are all near a strong W position and are therefore small. B played tenuki with because W's right side was strong, and after it was no less strong; so B should have played tenuki again and responded at a instead, attacking where he is strong. An Oomori principle: Once you tenuki from a position, tenuki to the end! Black to move. This is one of two theme diagrams where it is discussed whether should be the defensive move at b. Here the answer is no, because B's corner group is strong and doesn't need defending; and , being right next to B's corner group, is of low value; and since W is alive both in the upper right side and lower right corner, B would have nothing further to aim at. If B does play at b then W tenuki at a would be a fine response, and a variation is supplied showing just how fine. So should be at a instead, and if is at b then B can tenuki again, invading at c. The diagram below is a continuation from these three moves. In the alternate theme diagram W's upper right group is very much weaker. Also, on the lower side, instead of a B stone below the star point there are are some W stones near there, so B's "outside the corner" group is also much weaker. In that case at b is recommended. Continuing from the diagram above, Black and White play out a side invasion joseki which ends with W's sente. The book provides a variation in which is at a and B ends up in fine shape; but here is played down, towards the edge. Tenuki at and is still recommended -- Oomori pauses to show that a B move at 5, say, is not even sente against W's lower right corner. 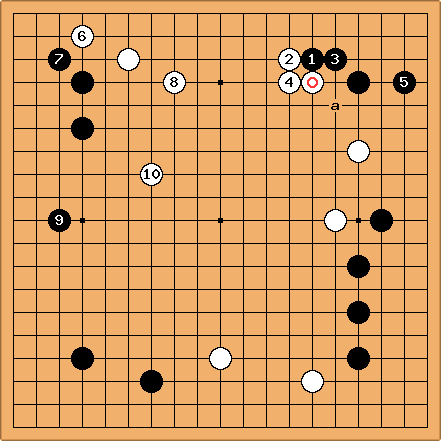 If next , W now threatens to capture four B stones with the cut below a; but tenuki is still recommended, with B seizing the initiative at and . Surrounded by W stones, the threatened B stones have ceased to be of any importance, and can be sacrificed. This the first theme diagram in the shinogi chapter. Black to play. In response to we are given the choice of Ba, running, or , living locally. yields life in the corner but ends in gote, the safety move being necessary. Then seizes the initiative and W gets too good a result on the outside. So Ba is recommended instead. is the recommended move. Several variations are then shown, corresponding to some of the possibilities for . In all of them, B gets safely out, with good leverage against some of the neighboring W stones. The variation shown here continues after with Wa and Bb. Oomori remarks: " 'Do not push your opponent along the fourth line' -- are you concerned about that? Well, after , through simply are necessary for getting out." Another Oomori principle: When your stones are weak, don't be concerned with territory. First, Wa is simply ineffective: via a variation starting with Bc, W hane at d, and then Be, B's moyo is nearly undiminished. Wb is too deep, and backfires: With Bc,Wf and then Bg, W's eyeless group is attacked and chased through dame while B actually enlarges his moyo. An Oomori principle: there's no time for invasions in the early opening. Oomori: Light play following reduction is a basic principle.